Another pic taken at Muscatine, IA. 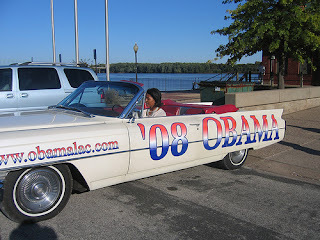 She said getting behind the wheel of the Obamalac reminded her of her father's car, a Buick 225. He worked for the Chicago fire department and sent two kids to Princeton U! She is so proud of her Dad. And her husband!! Michelle Obama visited beautiful Muscatine and asked the Obama supporters to get the word out on his experience, accomplishments and hopes. She is going on to Davenport later today. I hope Phillip Tunnicliff was inspired by what the Senator had to say about the war in Iraq. He was in the crowd of people on the banks of the Mississippi to listen to Obama's words on Iraq. Back in 2002 I took my grandson, who was about Phillip's age then, to see and listen to people speaking against war with Iraq. It was an event along the 100 block of North Michigan Avenue, downtown Chicago. I didn't know until much later that Senator Obama was speaking against war with Iraq just a block away from our location that day! Anna Tunnicliff opened her life and shared the experiance of hearing Sen Obama talk about Iraq. It was a warm, sunny evening as she listened to the Senator conduct a Town Hall Meeting. I'm sure she will always remember this night! Note the new Skywalk in the background. The next President returned to Davenport, Iowa to give a speech on Iraq and conduct a town hall meeting. He was warmly received by many people and a few trains tooted their support as they rolled by! 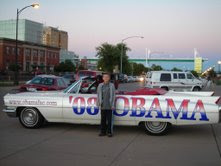 Jim Kerr, pictured with the Obamalac, has been a supporter of the Senator ever since he first announced his intention to run for the senate. Jim and I worked the precints in Rock Island, IL when the primaries started back in 2004. Jim is an elected official (Democrat) in Rock Island and also is a very good golfer! 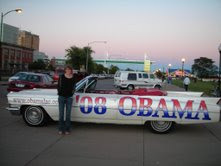 Picture taken near the LeClaire Park bandshell along the Mississippi 12 Sep 2007 while waiting for Obama to arrive. What a beautiful day in our life! Sunny, low humidity, a little breeze, and a gathering of people to celebrate the working people. I had a million "thumbs up" this morning. Thanks to my best friend, the love of my life, my wife Barb for the picture. And thanks to Sen Obama for a promising future for all of us!